This project has been dedicated to bring several alpha and beta stages of age of empires 2 into today's game. The game has undergone almost an entire conversion to the days back in 1998 and early 1999 when age of empires 2 was still in development. > Beta objects unhidden from the game in their full glory and graphics. But the terrain graphics have been my most intensive project of all! terrain tile sets back from the pre alpha without being required to own that version. This unique project will reveal some pre alpha terrains that never have been shown in the real game before. Many weeks, dozens of hours went into the project by extracting, fixing, and re palette all frames. adapt dozens of graphic id's and importing deleting and replacing massive amounts of slp graphics. and other tasks.. I have also kept to a cool policy called, no aoe1 frames! Yeah, the orriginal beta didnt had all it's unit frames created yet, so the designers decided to replace the unfinished unit frames with aoe1 graphics. I removed all aoe1 frames and replaced them with similar beta frames from the units that ensemble studios (the creators) finished. This makes the mod give a much better look as previous attempts to convert the game to betastyle failed due to limited time and the aoe1 frames. and screenshots from early stages from the game. from over 27 screenshots to keep recombining the parts of textures by overlapping them til I got the complete textures. One important note: This is a compilation of several stages of the pre release phase of the game. I worked hard to fix most graphics to their best beauty but remind that not everything is perfect because the game was in development. I hope you enjoy the game and make your new beta maps! Tip: you can make customized random map scripts to make an extra cool beta look on the maps. Please inform me if you plan to use graphics from this project for your own work, thanks. > Tommy: For helping me search beta materials on the web. and ofcourse ensemble studios! I am so proud on your works but it's good that these things hopefully wont be forgotten. > When you run restore.exe, it will extract the files to a new directory called "Backup" to prevent the modfiles from being overwritten automatically, so you can pick the files you want to restore from that directory. - Movement graphic of scorpion overlapped by modern version has been fixed. - All dock problems have been fixed: Too big size, can't build, civilization graphics stuck at west europian. - All problems have been fixed where units show slow dying graphics. - Dirt Patches nolonger overlap other graphics. - Sea Tower Graphics colors have been fixed. - Town Centers are nolonger accidentally overlapped by some non beta graphics. - All known errors with no working player colors are fixed. - The Beta bridge graphics have been eliminated from the mod because their design itself was flawed and not just an anchor issue. A lot of soldiers have attack graphics from other soldiers the priest with relic walking north has problems some units have the same dying graphic well its just the making of so I shouldn't expect it to be complete the graphic ideas long ships look better the units have a new I mean old look but many of them are incomplete. dirt 2 and three don't look anything like dirt one dirt one could be a little bit dark the trees and cliffs look nice I like the iron mine look. Age of Empires 2: The Making Of is a very unique Mod Pack. Over the Years many people have added Mod Packs that changes some of the Buildings or Units to the Beta or Alpha units that ES had originally made but they only added one or two Beta Buildings/Units. This Mod Packs adds them all in. After weeks of research Taichi San has found as many Beta Units and Buildings that she could and added them all into one Mod Pack. Taichi San has not only added Beta Objects but Old Beta terrains as well! In my personal opinion the Beta graphics look much more realistic and much better than the ones ES decided to use in the game. There are also new icons for the units. I'm not sure if Taichi San made these or not but they are very nice and much better than the original. Though Taichi San did not create the Graphics herself she spent lot of time trying to find the Beta Units. The Beta graphics are very good quality and in my opinion better than the normal ES graphics. They seem a lot more realistic when moving and attacking. The only problem I can find is that some of the units don’t have dying graphics, the ones that do seem to have very slow dying graphics. The new icons too are much better as well. Overall the Quality of this Mod Pack is fantastic. Very Clear Instructions are given for installing and uninstalling this Mod Pack. Taichi San has put the files needed into their own custom extractor which is easy to use and extract the files into their correct places. There is another extractor to extract the backup files to restore the old graphics. The Instructions Taichi San has given are clear, easy to follow and easy to understand. The Mod Pack is very useful. it gives a change in scenery and a much better look to Age of Empires. The graphics make the game much more realistic and would make your scenarios much, much better. A very good Mod Pack that has required alot of searching the web. It brings back the old Age of Empires from the 1998/1999 Beta testing. In my opinion much more realistic and much better! 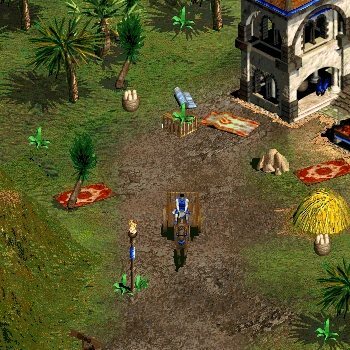 Age of Empires 2: The making of is a half conversion of AOK. It contains graphics from the pre-alpha, alpha and beta versions of the game. There is a lot there to look at and you can immerse yourself quite well in what usually would only be viewable by looking at screenshots. Only now you get to play with it. There have been a few beta mods before, usually containing castles and a few houses but this modpack contains a lot more than that. It includes a few new terrains, replaces 50% of the current buildings and replaces many new units with their alpha/beta counterpart. You could certainly create some real medieval scenarios with this as it definately has a more rustic feel to it. It also comes with a few bits of added eye candy to vary your maps with a bit, aswell as the mountains and terrain. It certainly is creative, it's certainly fun to look at (for a bit) but I can't forget that in some cases I don't get that wow factor. For example random map can feel a little disjointed sometimes with the clashing unit styles, the dark mud terrain does stand out a lot and even though through no fault of Alexandra, it doesn't always fit the scene well. It's hard to tell sometimes but OVERALL I can see why Ensemble called this a beta version and not the full version. Sorry to disagree with a couple people but I prefer the final version. Never the less, I still liked the conversion enough to give it a 4, but there are still a couple things to do or add before it becomes 'useful' in itself as much as it possibly can, for now though it won't be getting a permanent install (which is a shame). Overall the quality was very good. The way the mod was put together shows a lot of work went into it, especially copying all the buildings out of pre-alpha/beta screenshots and making them suitable for in game. I can't comment particulary on the actual buildings because they were all made by ensemble and it wouldn't be right to effect the score because of them. Some of them I prefer, some of them I don't but as anything it is a personal decision. I am probably just nit picking when it comes to detail but a couple of terrain issues struck out at me. I believe the pre alpha dirt 1 should have been used to replace dirt 1 not the mud. Although the mud could have still been in it. There were a couple of minor things such as the bridge anchors being slightly slightly off and also the dirt patch slp needs to be edited in genie so it doesn't overlap other objects, a couple of buildings are obviously bigger than the actual size so units walk through parts (saying that I feel this is probably better in a RM viewpoint than editing them to fit). Instructions were easy, there are two files one to unzip the mod, and one to unzip the backup files. The one important thing I found though was the backup replaces your game with the ORIGINAL game files, not what you had there before. The only important files it replaces are the .dat files but if you had a mod installed before or a custom data file unless you backed it up you will have lost it. In my personal opinion the beta mod is still in its beta phase. There are still things that can be put in the game (like the Japanese eye candy or pre alpha trees etc) to really put it all together. It's definately a great mod, and a lot of people will enjoy it, but for now, I still see it needs improving and probably released slightly too early to be complete. I imagine though, overtime it might get updated. Once all together and fully playable with I would give it a 5. In a sentence – A high standard mod. It certainly takes people back in time and allows them to create levels in an all new perspective, yet stays true to the way AOK is played. This modpack changes most of the Age of Kings units, buildings, and terrains, as well as some interface graphics, back to the Beta, Alpha, and Pre-alpha versions of the game. Many people have lamented the loss of these graphics and Taichi San has answered the call and this is the result. While not horribly original, this is the first mod to completely convert AoK back to the pre-release versions. The terrains in particular I had never seen in a mod before, as well as a lot of the eye candy. Taichi San's refusal to use AoE1 units was also appreciated and a new concept. Novelty therefore, gets a 4. Overall, this is an amazing piece of work with few flaws. I highly recommend this for download.